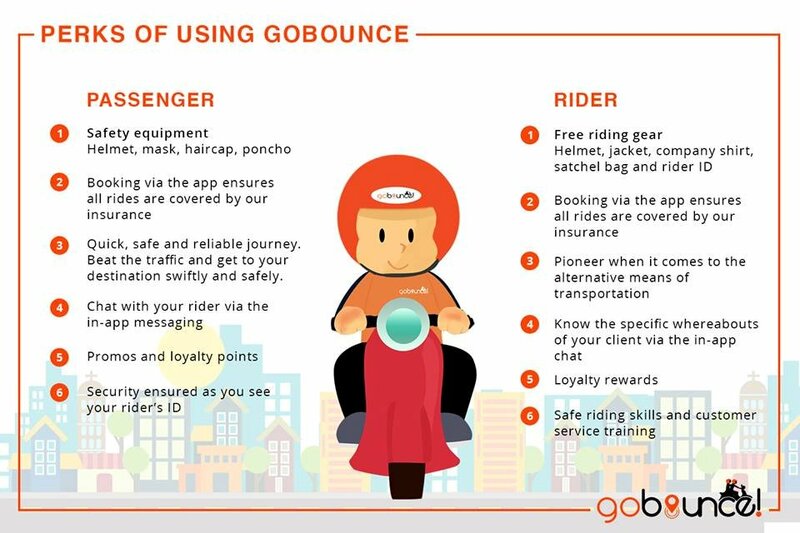 In a simple ceremony held at the Metrotent along Meralco Avenue Pasig, Gobounce Asia founder Kevin Moylan formally launched the mobile motorcycle booking application aptly called “GoBounce”. The app is currently available for download from Google Play Store for android phones and soon from App Store for iPhones and iPads. Gobounce Asia is a local start up that built a booking platform for multiple services using motorcycles. Through the locally-developed software, one can book for a ride, sent parcel or documents, fetch food from restaurants and even groceries. A group of Filipino programmers led by Carlo Mariano started working on the platform in March and came up with a working model by May. After a couple of months of testing, the app is now ready to be used by the public. The availability of this application-based service cannot be more timely because of the unabated traffic congestion in the Metro that is estimated to cost the country some P2B losses daily. Using motorcycles, services under the GoBounce app will reach customers without much delay. 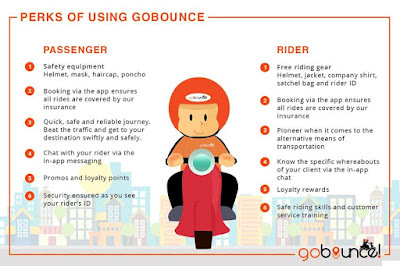 Gobounce Asia assures that its rider-partners are safe, quick, and reliable. Each rider-partner is screened through a Skills Assessment test administered by Safe T Ryders Training Center. In addition, every motorcycle unit is inspected for road worthiness. They also undergo seminars on defensive riding, customer service and rider etiquette at the Gobounce office. The rider-partners are issued uniform helmets, shirts, waterproofed jackets and ID cards. For safety and sanitary purposes, passengers are given hair liners for the helmet, dust masks and raincoats, in case of rain. Further, passengers who booked via the app are covered with P 200,000 insurance by Mafre Insurance. The rider-partners are not employees of Gobounce Asia. They are service providers who on their own pace and time. Hence, their income depends on the amount of hours they put in. They are also required to have NBI clearance, TPL or Third Party Liability, and more importantly a professional driver’s license. The services launched last Monday were GoRide and GoMessenger. The GoBounce menu will soon expand to include GoMassage, GoLux, GoGrocery, GoFood, GoPet, and more. At the launch was the Vice Mayor of Calatagan, Andrea Del Rosario, who sees the need for this application in area. Many residents often migrate to Manila looking for employment. With GoBounce, her constituents can work in Calatagan and nearby areas. Already owners of motorcycles, all they need are training on defensive driving. Rides start at P 40 for up to 3-kilometers.